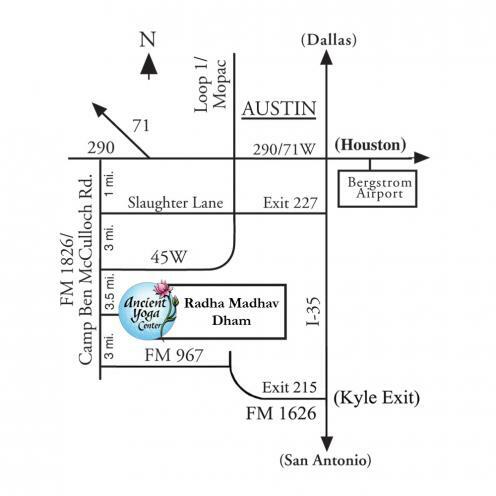 Ancient Yoga Center is located in Southwest Austin, Texas and on the grounds of JKP, Radha Madhav Dham; approximately 35 minutes from the airport and 30 minutes from downtown Austin. ​If you are using GPS, use the address 400 Barsana Road, Austin, TX 78737. You will enter the main entrance of Radha Madhav Dham and follow signs to the Ancient Yoga Center. If you are arriving by air, Austin Bergstrom International Airport is 29 miles from the Ancient Yoga Center, and is serviced by all major airlines. Taxi and shuttle service is available from the airport. • Follow Mopac/Loop 1 South. • Continue through the light at Slaughter Lane. • After 2.3 miles, Loop 1 South becomes 45 West at a sharp right curve. • Continue on 45 West for 2.5 miles to FM 1826 (T-junction). • Turn left onto FM 1826 and drive 3.6 miles. • Look for a large sign for Radha Madhav Dham on the left. 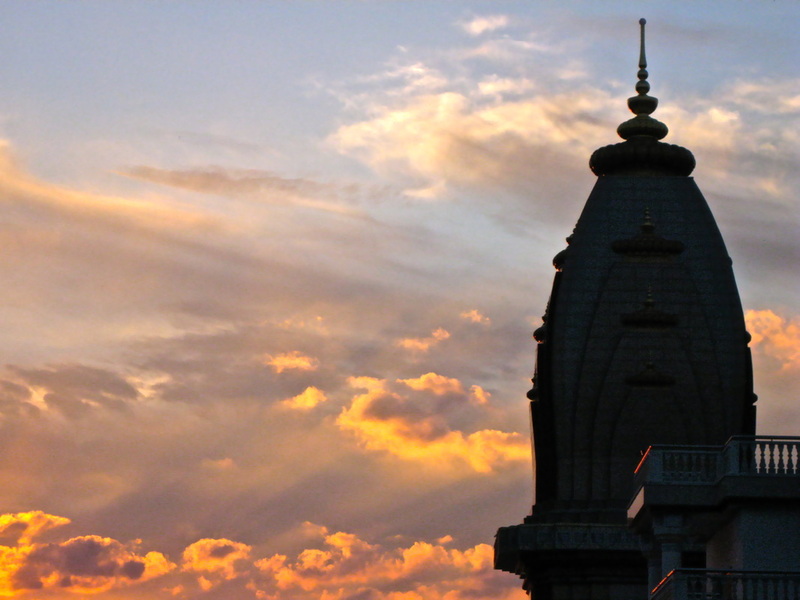 The main entrance to Radha Madhav Dham (also for the Ancient Yoga Center) is 1/4 mile further. • Turn left at the Radha Madhav Dham main entrance onto Barsana Road and follow the blue and white signs to the Ancient Yoga Center. • Take I-35 South until you reach Exit 230 US-290 West. • Take Exit 230 US-290 West towards Johnson City. • Continue on 290 West. • Take the Loop 1 South exit and drive 6.3 miles. During this stretch, the highway will stop and start and you will go through two traffic lights. • Loop 1 South becomes 45 West at a sharp right curve. • Take US-290 West into Austin. This will bring you north of downtown Austin. • Continue on US-290 West. • Take I-10 West to TX-71 West into Austin. • Continue on TX-71 West/US-290 West. From the Austin-Bergstrom Airport, drive 10.4 miles. • Take I-35 North to Exit 215 Kyle Parkway/1626 N.
• Drive .5 miles to Kyle Parkway/1626 N.
• Turn left at the light onto Kyle Parkway/1626 N and drive 6.2 miles. • Turn left onto RR 967 North and drive 9.2 miles. • Turn right onto FM 1826 and drive 3 miles. • Look for a large sign for Radha Madhav Dham on the right. The main entrance to Radha Madhav Dham (also for the Ancient Yoga Center) is 1/4 mile further on the right. • Turn right at the Radha Madhav Dham main entrance onto Barsana Road and follow the blue and white signs to the Ancient Yoga Center. • Drive northwest out of town on RR 12 for approximately 8.5 miles. Stay to the right. • Turn right onto Elder Hill Road (at the Driftwood Winery) and drive 4 miles. • Turn left onto FM 150 and drive for approximately 1 mile..
• Turn right onto FM 1826 and drive for approximately 5 miles. • Driving east on US-290 East drive 7 miles from the intersection of US-290 & RR 12. 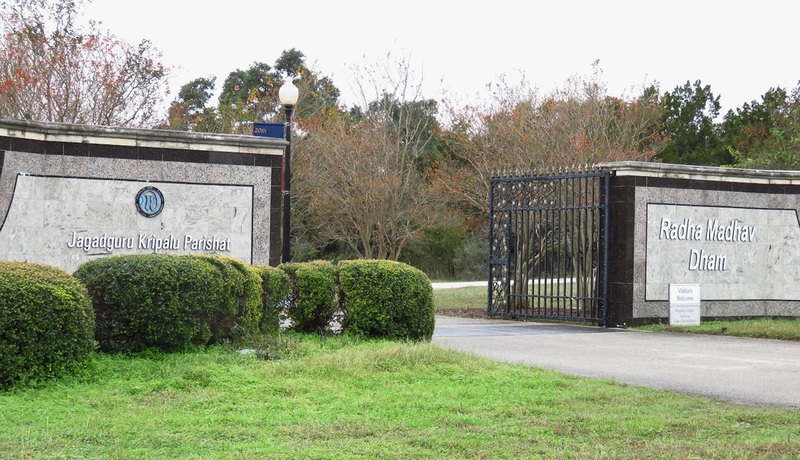 • Turn right onto Hwy 163, Nutty Brown Road, and drive 3.5 miles to the end of the road. • Turn right onto FM 1826 and drive for 1/2 mile. • Follow the signs to exit the airport. Turn left onto TX-71 East/Bastrop Highway. • Almost immediately, merge onto TX-71 West and proceed 10.4 miles. Along the way, TX-71 West joins US-290 West. View a map from Google with directions. View driving directions as provided by MapQuest.